India announced Sunday a general election to be held over nearly six weeks starting on April 11, when hundreds of millions of voters will cast ballots in the world's biggest democracy. The poll will see right-wing Prime Minister Narendra Modi run for a second term against Rahul Gandhi of the Gandhi-Nehru dynasty to lead the world's second-most populous nation. From April 11 to May 19 voters will elect 543 lawmakers to India's lower house of parliament, the Lok Sabha, which governs the Asian nation of 1.25 billion people from the capital New Delhi, the electoral commission said Sunday. Counting will be completed and results announced on May 23, it said. "The festival of democracy. Elections are here," Modi posted on Twitter late Sunday. "I hope this election witnesses a historic turnout," he added, encouraging first-time voters to cast their ballots in record numbers. Modi's Hindu nationalist Bharatiya Janata Party (BJP) and Gandhi's left-leaning Congress are the two strongest challengers among hundreds of political parties from across the culturally and geographically diverse country. Modi, whose right-wing party won an outright majority in the 2014 elections, enters the race in a strong position, the 68-year-old remaining a popular figure and the BJP a well-oiled political machine. In recent weeks he has been able to bolster his nationalist credentials in India's most serious standoff with Pakistan in years, sparked by a suicide bombing in the disputed Kashmir region on February 14 that killed 40 Indian paramilitaries. Doubts have been raised about what the raid achieved, and when Pakistan carried out its own air raid a dogfight ensued and an Indian aircraft was shot down and the pilot captured by Pakistan. But Modi has shrugged this off and has continued to talk tough, accusing the opposition of being weak. 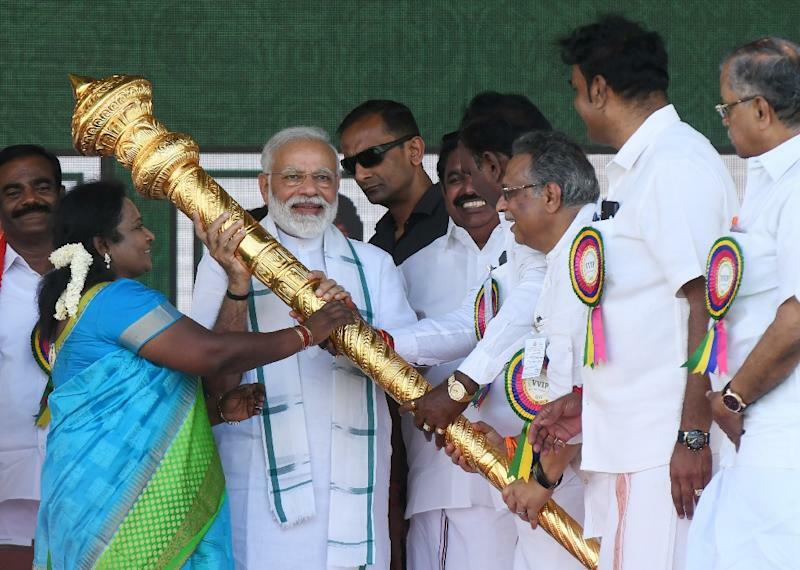 "We won’t spare anybody who is looking to destroy our country even if their (terrorists’) chiefs are sitting on the other side of the border," Modi told a recent rally. "But the oppositions have a problem with such stern actions too. But I am going ahead with my resolve to root out terrorism," he said in his home state of Gujarat. The prime minister has also sought to contrast his humble origins as a tea seller against Gandhi, the 48-year-old privileged half-Italian princeling of India's most famous family. Congress, which has ruled India for much of its time since independence from Britain in 1947, won three key state election victories in December, chipping into Modi's core support base in the Hindi "Cow Belt" regions home to nearly half a billion voters. He has also gone on the offensive over Modi's economic record, with the Congress state wins attributed to the prime minister's perceived failure to help impoverished farmers and to create enough jobs.